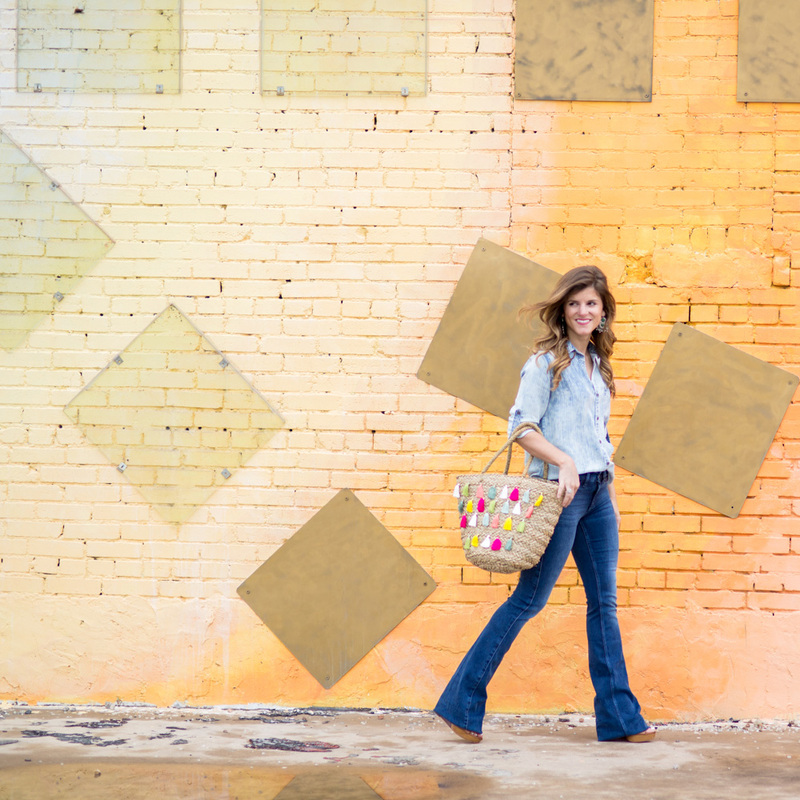 I bet ya didn’t know how much use and wear you could actually be getting out of your go-to chambray shirt! And the good news is that today I’m going to SHOW you how to wear a denim shirt by giving you 13 different ways to wear and style it! I’m pretty stoked about this post because I think it’s a pretty comprehensive list (if I do say so myself) that explains how to wear a denim shirt by showing you ALL the different ways you can style one. If I had to list closet staples that all girls MUST own all on one hand, I would for sure list a chambray shirt as one of the top three pieces of clothing that every girl should have in her closet. It’s SUCH a fabulous basic and unlike most items in our closet, it can work for all 4 seasons. That being said, I wanted to devote an entire post to talking all about how to wear a denim shirt. I went through all my old posts and instagram photos and found the best of the best outfits that feature all the different ways you can style a chambray shirt. At the end of the post, I’ve listed my favorite places to shop them and which retailers usually have the best shopping options. I’d be willing to bet that this first way I’m going to show y’all is not one of your go-to ways to wear a denim shirt, but hopefully it’ll give you another way to get more use out of your fave chambray! A classic denim shirt is a great layering staple and yet another way you can layer your chambray is by tying it over a dress. Spruce up your basic striped or solid-colored maxi dress by tying a chambray top over it. This is a great use of your chambray shirt when you’re looking to add an extra layer for warmth or style to your maxi dress. It also comes in handy if your maxi is a little too strappy up top for your comfort. Another favorite way to wear chambray is to use your shirt as a belt and add a little shape to an oversized dress. I typically tie my shirt higher up on my “actual” waist so it created a synched and dramatic look like I’m doing in this photo here. You could also use your jean jacket to do this, but I prefer using my denim shirt because it’s easier to tie and not as heavy or bulky. During the cooler months, I use my chambray as my go-to layering tool and find myself layering it under all different kinds of sweaters and cardigans. I love the way it gives just enough accent to the sweater without looking too super preppy or overdone – it’s enough. In this look I layered an oversized cream sweater over my light chambray shirt for a different take on your typical denim on denim ‘Canadian tuxedo’ look. Although I paired it with denim, the sweater and chambray combo would look just as cute with black distressed jeans or even white jeans too! I wasn’t kidding when I said I do all sorts of layering with my chambray shirt during Fall. You really can do SO MUCH with a basic denim shirt (hence why I’m writing this post for you!). 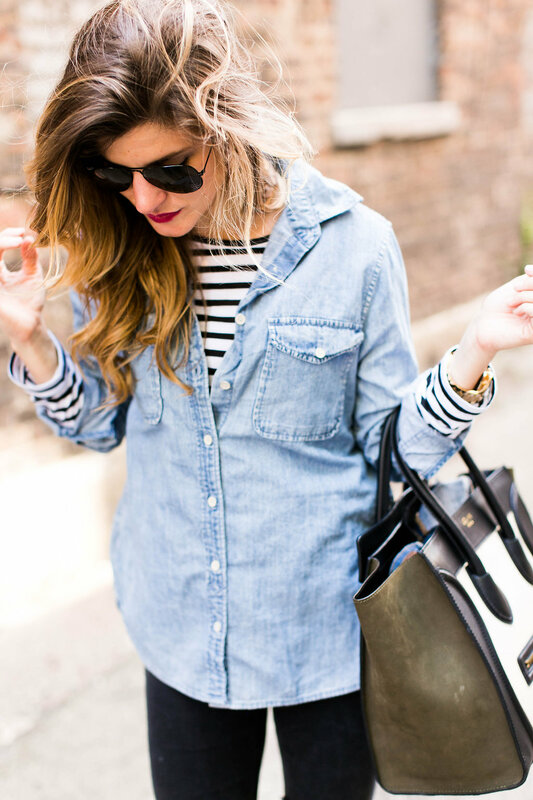 Next up I’m showing you another way to make your chambray interesting and that’s to layer it over a striped tee. In this look, I buttoned my denim shirt over a long-sleeved tee to add a little dimension and something interesting to your typical black jean and chambray combo. I love the striped accent under the denim shirt but it would look just as cute to wear a solid color under it or even a turtleneck with a statement necklace if it’s super chilly outside! This is slightly similar to wear it with a maxi dress or paired with a maxi skirt except that you leave it unbuttoned (like in the photo). It’s super cute for if you’re wearing a bodycon dress and you’re a little self-conscious about how tight it is on our behind (or at least that’s why I wore it! lol) or if you just want to add another interesting element to your outfit! It’s also cute over a dress that isn’t as fitting – like more of a flowy swing dress like I’m wearing in this photo above. One of my favorite ways to wear chambray – and one that I find myself resorting to pretty often – is with white skinny jeans. 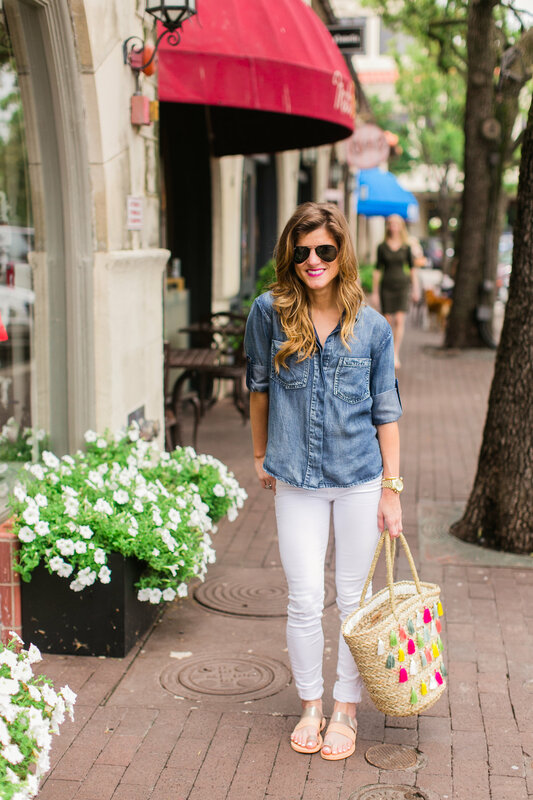 I love the contrast of the denim and the different spin it takes on the denim-on-denim look. You could also pair this look with a statement necklace and wedges to dress it up for a night out with friends. Although I’ve seen some people wear dark on dark or light on light denim well, I think it always looks better to have some sort of contrast when wearing denim on denim. This is an easy and attainable way to pull off the double denim look without having to worry about matching your denims. I love wearing my chambray as a light jacket during the spring months. It’s not as bulky as a denim jacket so it’s a great alternative that serves the same purpose AND looks super cute. Here are two outfits where I’ve worn my chambray this way. Although it’s cute to wear your chambray shirt untucked with jeans, try adding a sweater around your waist to create another – although still super casual and laid back – look with your denim shirt. So far I’ve shown you lots of ways to wear a denim shirt with different types of bottoms (and a few dresses), but let’s now talk about pairing your denim shirt with a skirt. I love the idea of pairing a chambray shirt with a skirt. You can wear it untucked for an oversized look or tuck it in for a more preppy outfit. Mix and match your skirt texturizes and patterns too. Stripes and bold colors look great with a denim shirt. This is a great way to incorporate the into your outfit. Instead of leaving it untucked like I did in No. 9, try tying it at the waist as you’ll see in the outfit below. This look typically looks best with high-waisted skirts in my opinion. This is an easy breezy look for summer and could easily be dressed up or down for day or night time wear. 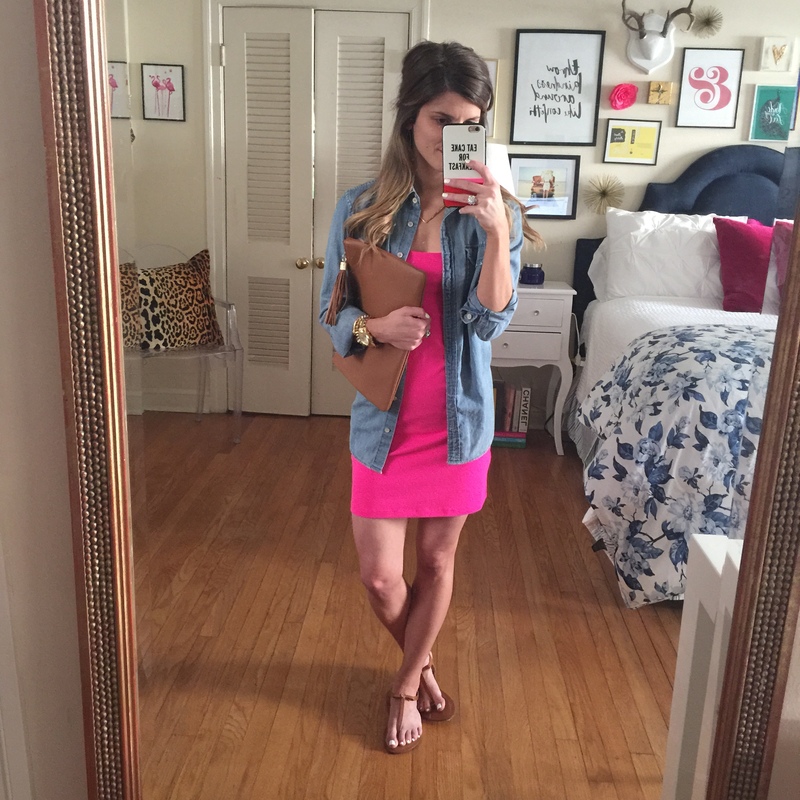 I love tying my chambray over dresses (like I showed you with the maxi dress) or pairing it with a skirt or shorts. In this outfit, I paired my tied -up chambray shirt with a high-waisted mini skirt, statement earrings and wedges for a fun going out to dinner look for night time. But this would easily look just as cute paired with flats and simple earrings for day time errands or something more casual. Not sure if you can tell, but in the photos above and below I’ve got my chambray shirt on with leather leggings. If you can’t tell, sorry…I’ll try and do another look once it’s that time of year again but just trust me when I say that chambray is super cute when paired with leather! I love the contrast in the materials! 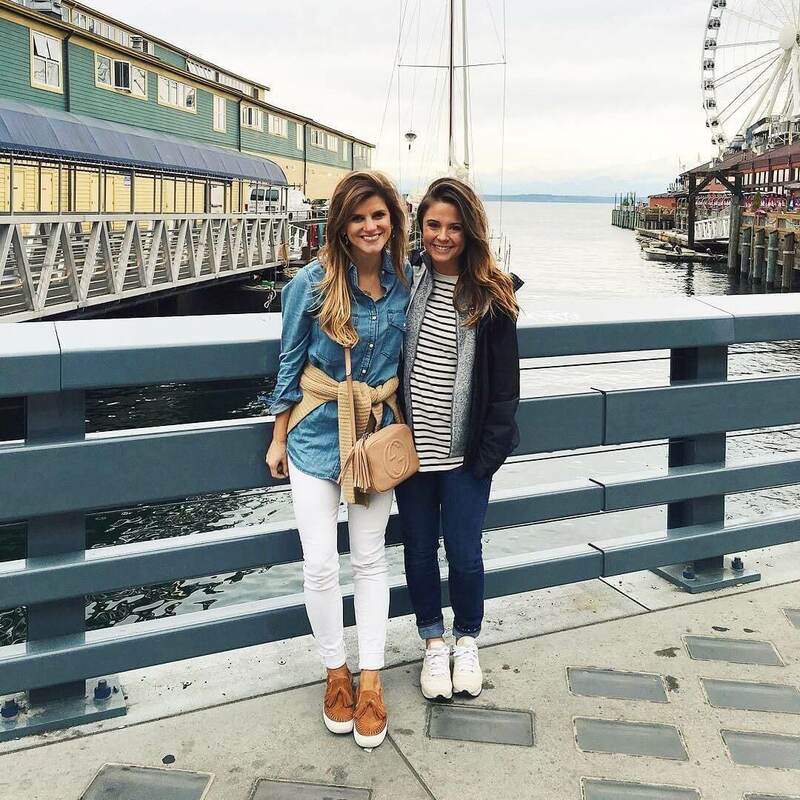 Gap and Old Navy – although sometimes their fit isn’t as good (not structured enough for me) it’s still worth giving them a shot if you’re in the market!